"Like many people, I dislike training courses but it's a legal requirement in the child care sector. The ex-paramedic from OCFA who taught us was friendly, witty, and made the course enjoyable. However, in an emergency, we probably all expect that there will be other people around who will know what to do…"
"A couple of weeks later, I was enjoying a very hot sunny day, cycling with my husband in a leisure park. All of a sudden, we heard a woman screaming. We looked over and I saw a lifeless child of about 3 years old being passed around to other adults like a "hot potato". It was clear that no-one knew what to do..."
"I dropped my bike, ran over, grabbed the child from the person holding him and lay him down on the ground. I checked his mouth and throat for any obvious obstruction. Then, I turned him over and with the heel of my hand, gave him several firm pats to his back. This I tried several times but he still gave no response." "Trying hard not to panic, I put my face down to his mouth to see if I could feel or hear any breath. It was then that he gave out a slight whimper. I put him in the recovery position and he slowly began to come around and started crying. I have never been more relieved to hear a child cry! By this time the paramedics turned up and took over from me." "It turns out that the child had spent a long time in the back of the car on a very hot day and had suffered a fit. He made a full recovery but this really made me realise how important first aid is. I don't want to be the person who doesn't know what to do in an emergency. And also I don't want to be the person, who needs first aid, where nobody is able to help." It is one thing to attend a course, but to implement the skills that you have just learned in a real-life emergency takes courage and Sally should be immensely proud. Would you have had the confidence to help? 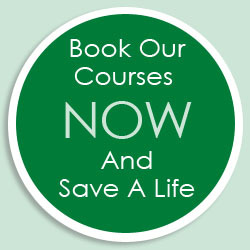 "Hi Jane, I just wanted to say a huge thank you for the First Aid Course I attended last week in Didcot." "I found it excellent as usual and Dian was a wonderful instructor. I look forward to repeating it with you again. " Time flies by when you're having fun and, in the middle of our normal month-end paperwork, we noticed that we are approaching our TEN YEAR anniversary working with Hampshire County Council! To date we have trained 5,398 delegates at Hampshire County Council so far during this period. We'd like to take this opportunity to thank Hampshire County Council for their custom and look forward to the next ten years! So, given our considerable experience, we would like to help you with your training needs. In this month's Hints and Tips, we look at Asthma Attacks. If you are with a child or adult who is having an asthma attack then the current NHS advice is firstly to help the person having the attack to sit up comfortably and talk to them to ensure that they keep calm. Help them to take their "reliever inhaler" straight away and encourage them to try to breathe deeply and steadily. Then loosen any tight clothing and, if their symptoms haven't improved after five minutes, then call for help by dialling 999 or arrange to see their doctor urgently. Meanwhile, do advise the sufferer to take one puff of their reliever inhaler every minute until help arrives. Congratulations to Tina Watkins from Home Farm Trust, the national charity that supports people with learning disabilities and their families. Tina correctly answered that Haggis is the traditional Scottish dish usually served on Burns Night. This month, we have a Ben's Cookies Selection Box to give away, because even after Easter you can never have too much chocolate! "From which tropical seed is chocolate produced?" Email your answer and contact details to Jane at: info@ocfa.co.uk and we'll draw one winner from the correct answers on Friday 2nd May 2014.